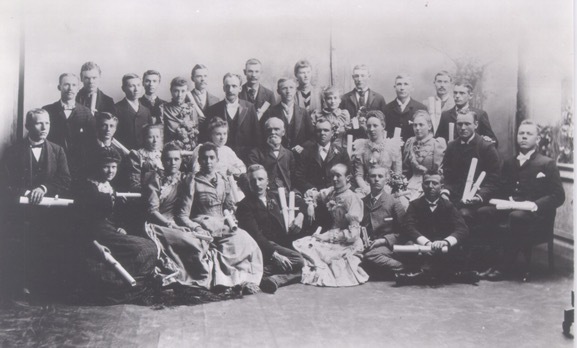 Cover image: LDS Business College’s first graduating class. SALT LAKE CITY, Utah, November 28, 2016 — The Salt Lake Stake Academy, predecessor to what would become LDS Business College, opened its doors in historic Social Hall in November 1886. The first class consisted of just 84 students. Now, 130 years later, LDSBC is home to more than 2,100 students. Their hard work—along with a fresh approach to training and results—is bringing new recognition to the College, the second oldest of four LDS institutions of higher education. LDSBC has experienced significant change since it was founded under the direction of Dr. Karl G. Maeser and William B. Dougall. During its storied history, the school moved eight times before settling in its present home at the Triad Center, two blocks west of Temple Square in downtown Salt Lake City, Utah. The curriculum has evolved from a focus on office skills to high-tech careers such as social media marketing and cybersecurity. Today, LDSBC is thriving thanks to its ability to see demand and provide a skilled workforce. The global economy is booming, and companies need talented, trained workers ready to produce now. To address the need, LDSBC provides focused education that offers precisely what companies request. In return, companies line up to hire the College’s graduates. With majors in business management, paralegal studies, health professions, interior design, information technology, computer programming, social media marketing, and applied technology, LDSBC trains students to be proficient in just 1-2 years. The hands-on classes optimize students’ investment as they work on projects. Graduates enter the workforce prepared and often debt-free. The College also helps students achieve self-reliance in a Christ-centered environment. It provides a skills-based, market-driven education, and it awards two-year associate degrees and one-year certificates. Students can gain additional skills through shorter online courses. LDSBC is home to students from all 50 U.S. states and more than 60 countries. For those who seek employment, nearly 90 percent obtain a job in their field of training within 90 days of graduation. The focus on skills and training that began in a burned-out bookstore in 1886 is now helping students—and businesses—succeed in a global world. Great school. It's been my blessing to work there for a number of years. It's an amazing experience to be around the students.